To mark World Tsunami Awareness Day on 5 November 2018, NOC scientists have prepared this Q&A feature on potential tsunami risks to the UK and its citizens. NOC scientists and engineers install and maintain tsunami-capable monitoring systems, both in the UK and overseas, as well as identifying tsunami and meteotsunami events from tide gauge records and core logs. In addition, NOC scientists are also modeling the impacts of tsunamis of various origins. This all forms part of the NOC’s commitment to research on the topic of protecting people and property from natural hazards. Tsunamis can be generated by various means including seismic events, like earthquakes, volcanic eruptions, landslides (including those occurring underwater) and some weather systems, which can generate what are often called ‘meteotsunamis’, for instance from a sudden drop in air pressure. What is the tsunami risk to the UK? Although tsunami risk to the UK is low, studies have suggested that an earthquake emanating from the Azores-Gibraltar fault zone is the most likely source of a tsunami that would affect the UK coastline. In fact, an earthquake like this destroyed Lisbon in 1755 and generated a tsunami that reached Cornwall and southern Ireland in around four hours. A North Sea earthquake at Dogger Bank in 1931 was the largest earthquake in the British Isles and generated a small, but non-life-threatening tsunami that reached the coast of East Yorkshire within around 30 minutes. Seismic events like these are monitored by the tsunami warning centres of NEAM-TWS, which disseminate tsunami warnings to member countries like the UK. Tsunamis can also be generated by landslides into or beneath the sea. The risk to UK coasts from landslide-generated tsunamis is not well known, but evidence indicates that the underwater Storegga Slide, which occurred around 8,200 years ago off the Norwegian coast, affected the UK coastline from northern Scotland to northeast England, with tsunamis over tens of metres high recorded at several sites. Such events are thought to be extremely rare - only two others are thought to have affected the UK coastline in the past 5000 years. There is also a suggestion that a collapse of the western flank of La Palma volcano, in the Canary Islands, might generate a tsunami, but the likely impact upon the UK would depend on the nature of the collapse. Published research by NOC scientist, Dr James Hunt, has found that large-volume slides in the Canary Islands have tended to occur as a series of smaller multi-stage collapses, rather than as one large coherent slide. This multi-stage style of collapse would greatly reduce the size of any resulting tsunami. Furthermore, these large collapses in the Canary Islands are very infrequent, and therefore the risk to the UK from such events is very low. Meteotsunamis are a more common feature in the UK, but are generally minor events of up to 30 cm or so wave height. What are the warning signs of a tsunami? Earthquake - If you are at the coast and experience an earthquake, it may have caused a tsunami, so you should make for higher ground or inland. Note that not all tsunamis will be preceded by an earthquake. Unusual sea-level changes - If the sea suddenly recedes, exposing the ocean floor, or there is an approaching wall of water, it may be a sign of an approaching tsunami. You should escape immediately to higher ground or further inland. Be aware that the first wave in a tsunami wave train may not be the largest. 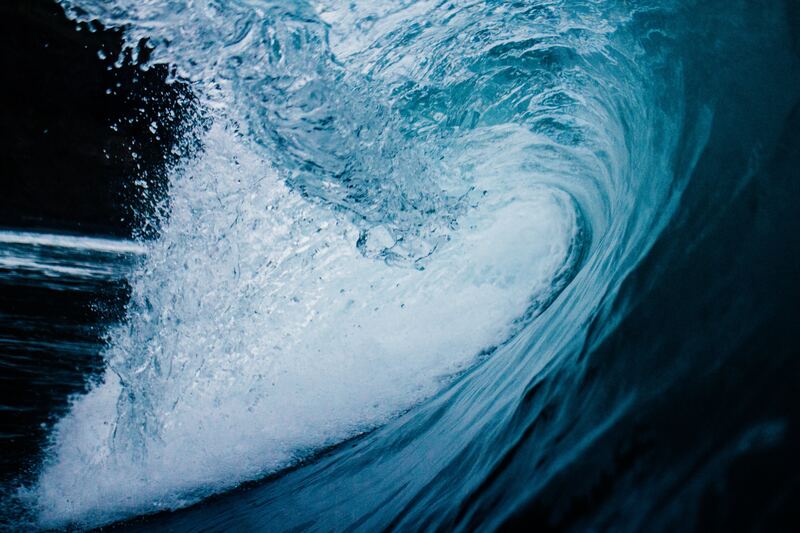 Ocean roar - a roaring sound offshore, like that of a jet engine, might indicate an approaching tsunami. In some countries with a higher tsunami risk, street signage and loudspeaker systems may be in place to advise the public of how to respond to a tsunami event. Tsunami events occur infrequently in the UK, but it is nevertheless important that the public is aware of the warning signs, especially if they often travel overseas to tsunami-prone areas. A sudden drawback of the ocean or an approaching wall of water and a load ocean roar can all signify an imminent tsunami, so you should move to higher ground or inland.